There's consensus among observers of the Oracle v. Google Android/Java trial that the jury has most likely identified infringements but hasn't yet reached unanimity on Google's "fair use" defense. Google's counsel was initially opposed to a partial verdict, though it appears that he would now accept one. But he didn't want the judge to ask the jury foreman whether the vote on the remaining question was "close". Google can probably figure that the evidence for willful infringement and against "fair use" is overwhelming, but Jonathan Schwartz' testimony might have had just enough of an effect that a minority of jurors doesn't want to consent to a finding that would be very likely to result in Google being found liable. In this post, I will firstly address why Schwartz' testimony doesn't prove "fair use", and then I'll discuss the various fair use factors (the ones that the jury has to consider) one by one. In front of a panel of professional judges, Schwartz wouldn't have been too impactful. In the eyes of professionals who listen to such testimony all the time, it would have been clear that he was pursuing a personal agenda. On the one hand, he wants to cover up his utter failure as CEO of the company (I don't want to sound like the "Occupy" movement, but it's a fact that Schwartz made tens of millions of dollars, while countless shareholders, including people who invested in Sun as part of their retirement plans, collectively lost billions), so he tries to justify his weak leadership in general and in connection with the Android/Java situation in particular. On the other hand, Oracle CEO Larry Ellison had called him out on his failure, so he's now out for retribution. "As CEO, his decision certainly trumps that of a salesperson like Leo Cizek, even though the latter may have taken it upon himself to make remarks that he was in no position to carry out." By that logic, the testimony of then-Sun chairman Scott McNealy (to whom Schwartz reported) also "certainly trumps that of a" CEO like Schwartz, who was "in no position to carry out" any major strategic initative without board approval, or who could have been replaced by the board anytime if he had refused to "carry out" the board's bidding. If Schwartz didn't want to sue Google, but if the board had decided that it wanted to, the board could have made him sue Google or could have forced him out anytime. It's furthermore regrettable that a salesperson (who generated money for Sun day by day, while Schwartz was lining his own pockets and failing to make shareholders money) is belittled by Google's counsel. Lawyers are important but they should always have respect for those who bring in the money that gets lawyers paid. "Just because Sun didn't have patent suits in our genetic code doesn't mean we didn't feel wronged. While I have differences with Oracle, in this case they are in the right. Google totally slimed Sun. We were all really disturbed, even Jonathan: he just decided to put on a happy face and tried to turn lemons into lemonade, which annoyed a lot of folks at Sun." There you have it: people at Sun felt "wronged". Fair use? No. Schwartz' testimony is contradicted by what people thought above him and below him, left of him and right of him, and especially by real people who created real technology and generated real revenues by selling Sun's technologies to real customers. In my opinion, the Gosling blog post is a silver bullet that would enable Oracle to strike down the Schwartz stuff if the fair use question had to be retried before a different jury. If all else fails, unanimity could probably be reached by choosing a procedural path that opens the door to powerful new evidence. Google's strategy of disregarding the intellectual property others hold in highly complex and creative APIs is the same for the Linux operating system as for the Java platform. In the mobile devices market, Android is the most widely-adopted Linux derivative as well as the most widely-adopted Java derivative. But Google distributes Android on license terms that are inconsistent and even incompatible with the GPL (the only license under which Linux is available at all, and the only one under which Java is available on open source terms from Sun). Google has basically taken those technologies and effectively relicensed them. Google has ambitious plans for Android. It will try to turn it into the number one platform digital television and for various other "embedded Linux/Java" platforms. Android's success, which is in no small part due to the aforementioned attitude toward intellectual property, attracts developers. 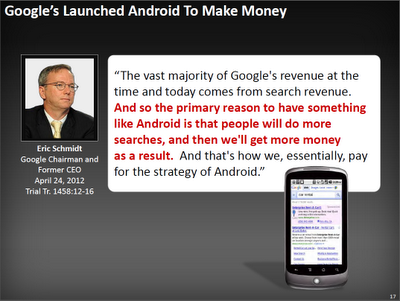 At some point, the very platforms Google hijacked will be supplanted by Android in pretty much every market segment. Embedded Linux (think of digital TV, navigation systems, home automation and everything else that will increasingly have a touch interface and/or wireless connection) and embedded Java will soon be dead if Google isn't stopped. Linus Torvalds, who started the Linux project, is an opportunist who will welcome anything that gets some of his program code distributed, no matter under which name or license. But what might work for one guy's ego doesn't work for any company that needs a sustainable business. The Oracle v. Google litigation is an opportunity to make Google respect other people's creations. For better or worse, the answer to the question of whether Google gets away with this conduct is, at least in the nearest term, in the hands of a jury. But that jury should be able to agree that hijacking a platform is the opposite of making fair use of it. And if a jury can't agree on it, a judgment as a matter of law is always an option. "Now, I will explain the law governing Google's defense based on the statutory right of anyone to make 'fair use' of copyrighted works. Anyone may use any copyrighted work in a reasonable way under the circumstances without the consent of the copyright owner if it would advance the public interest. Such use of a copyrighted work is called a 'fair use.' The owner of a copyright cannot prevent others from making a fair use of the owner's copyrighted work. For example, fair use may include use for criticism, comment, news reporting, teaching (including multiple copies for classroom use), scholarship, or research." What this explanation is missing is the fact that "fair use" is an exception, while infringement is the rule for non-licensed use. I ran a few Google searches to see which other words are typically put right behind the words "fair use": "doctrine" (585,000 results), "defense" (529,000), "exception" (292,000), "limitation" (92,000), "rule" (91,000). The three terms in the middle (defense, exception, limitation) all show that fair use isn't simply (as those instructions appear to imply) a question of "advanc[ing] the public interest". If fair use applies too frequently, copyright law loses its teeth. 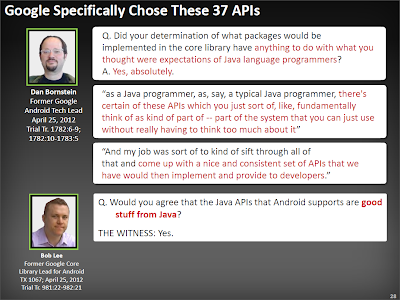 The examples that Judge Alsup listed at Oracle's request because those are also stated in the law -- criticism, comment, news reporting, teaching, scholarship, research -- are all of a nature that is fundamentally different from what Google says justifies its hijacking of Java. Let's look at the four "fair use" factors as stated in the jury instructions. "The purpose and character of the use, including whether such use is of a commercial nature, for nonprofit educational purposes, and whether such work is transformative (meaning whether Google's use added something new, with a further purpose or different character, altering the copied work with new expression, meaning, or message). Commercial use cuts against fair use while transformative use supports fair use;"
The part that may be less clear to the jury is the meaning of "transformative". The jury instructions make it sound as if the hurdle was much lower than it really is. A broad definition of "transformative" would include everything -- and would indirectly (even though this is only one aspect of one of four factors) reduce copyright law to absurdity. If everyone who steals a painting puts it in a different frame and draws a few simple lines on top claims that he "added something new [the weakest wording in the entire jury charge], with a further purpose or different character", the rule of law becomes a joke. In connection with software, the word "transformative" must also be used only in cases in which the purpose of something changes as fundamentally as (to use one of the examples listed further above) "criticism" (which serves a purpose distinct from the work that is criticized). Cases in which courts thought that "fair use" applied include thumbnail images of pictures on websites shown by Google's search engine. A search engine serves a distinct purpose (it's a catalog) from a website with original content. A thumbnail image may lead someone to click through to the actual webpage, but it's not a replacement for a high-resolution image. 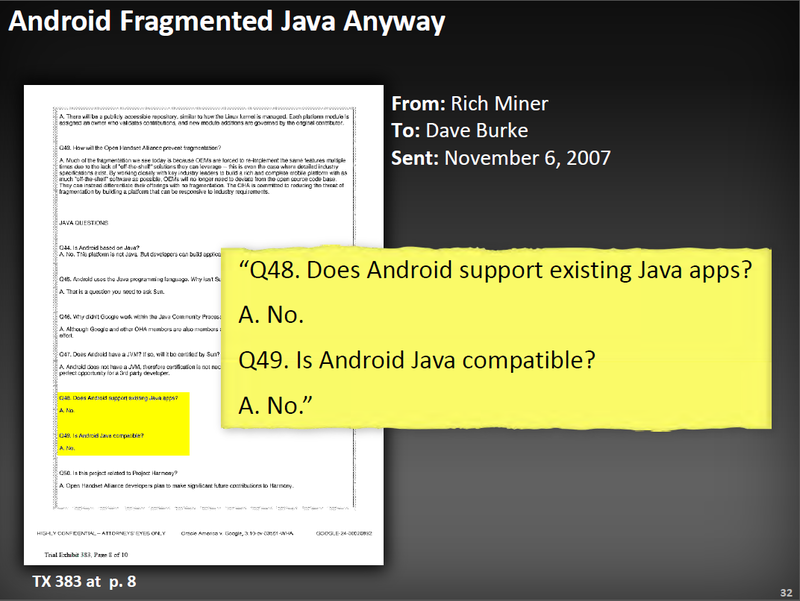 Android doesn't do anything seriously "transformative" with respect to Java. It uses 37 of the Java APIs and added some others. Putting A next to B doesn't "transform" either one. 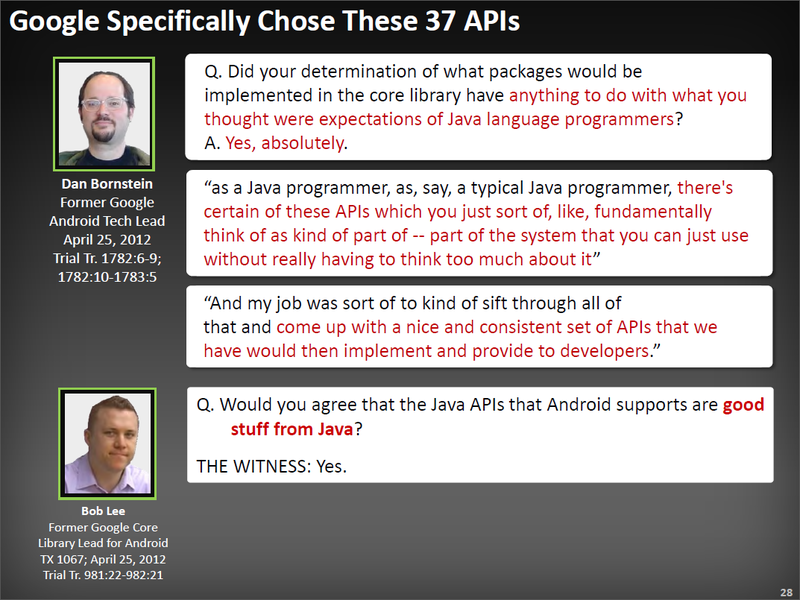 Google told the jury that it transformed Java by making it a success on mobile platforms: "No one before Google had been able to use Java to build a successful smart phone. Nobody." It's not true in light of devices like the BlackBerry or the Nokia Series 60 (and Andy Rubin's former company, Danger, built a licensed Java mobile device names Sidekick), but even if it were, it wouldn't be "transformative". Look at it this way: there's lots of stuff out there that hasn't yet been a commercial success on mobile devices. For example, there are definitely many computer games out there that run on PCs and consoles but not on smartphones. Still it wouldn't be "transformative" use for the purposes of a fair use analysis if every one of those games could be stolen and modified to run on mobile devices. "The nature of the copyrighted work, including whether the work is creative (which cuts against fair use), functional (which supports fair use), or factual (which also supports fair use);"
For the categorizations of "functional" and "factual", it's again important to consider that these can't be applied so broadly that software is, in the end, deprived of copyright protection. In a way, software will always appear more "functional" or "factual" than a painting, a composition or a poem, but lawmakers didn't want software to have weaker protection. "The amount and substantiality of the portion used in relation to the copyrighted work as a whole. The greater the quantity and quality of the work taken, the less that fair use applies; and"
It's always easier to assess quantity (of anything, not just software) than quality. In this case, it's particularly easy because Google's copying was extensive. 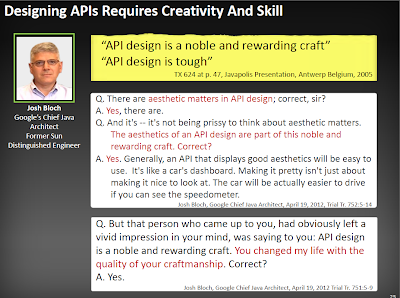 Google copied 400 classes containing 4,500 methods and 7,000 declarations, and the printed specifications of those APIs fill 11,000 pages. "The effect of the use upon the potential market for or value of the copyrighted work. Impairment of the copyrighted work cuts against fair use." The Android team knew that its platform was going to be incompatible with Java. Applications written for one platform generally don't run on the other (probably not even a single significant app would run on both). Judge Alsup also asked the parties a question about this in the copyrightability context. 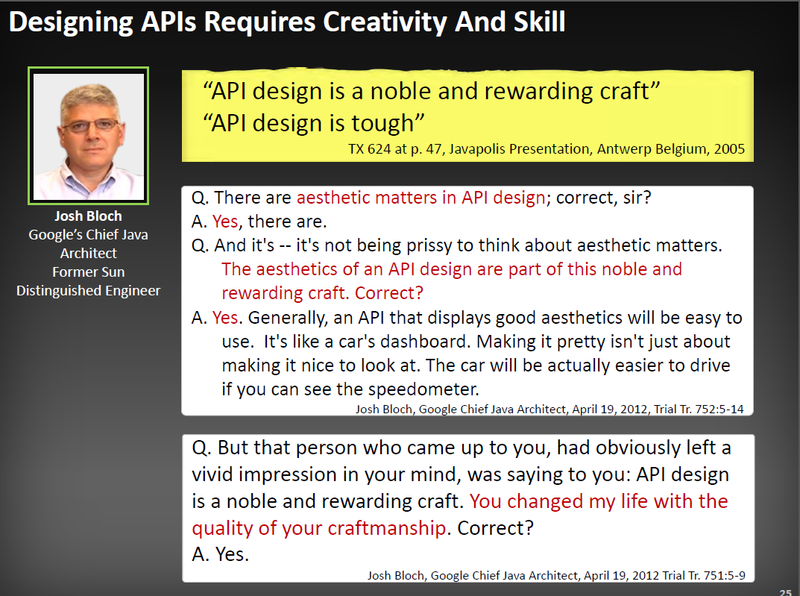 Those who claim, like Google, that APIs shouldn't be protected (or that otherwise any use of APIs should be considered fair use) typically say it's all about "interoperability" and "compatibility". 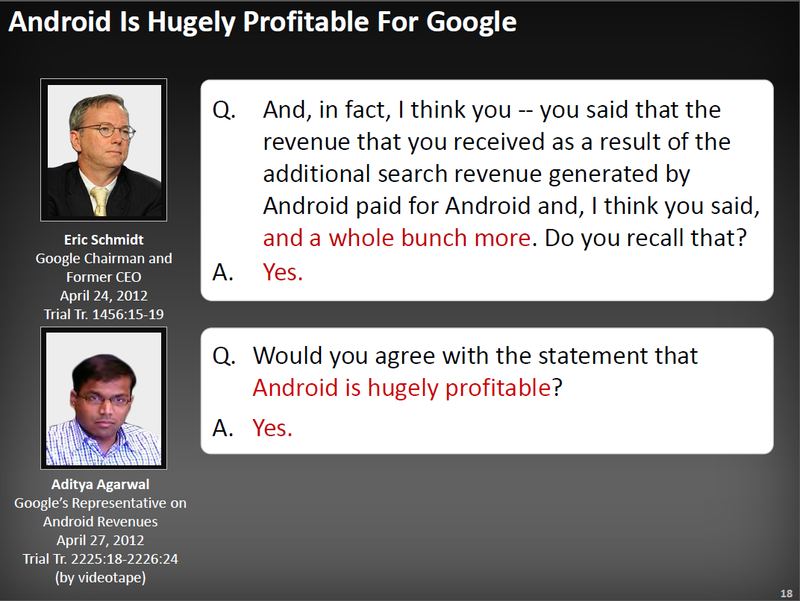 In my view, it's clear that what Google did here is best described as fragmentation and hijacking, and even if one wants to describe it more positively, it would pervert the concept of compatibility to use it as an argument that ultimately legalizes a platform that is incompatible because it was designed from ground up to be incompatible. The whole idea was to attract developers early on by providing them with a partially familiar platform, but now that Google has hundreds of thousands, or even millions, of Java developers on its platform, the development work done there doesn't benefit the original Java platform and the wider Java community.